Evidently unemployment has a beneficial effect on blogging. Today, we'll go over some background information for our next series of posts, whose topic will by the collectible trading card game Magic: The Gathering. Released in 1993 and developed by mathematician Dr. Richard Garfield, Magic established the trading card game as a genre, and may safely be acknowledged as the most complex card game in the world, with about 15,000 unique game cards at present. In this game, two or more players combat each other using spells represented by cards which they've organized into decks. In theory players can build their decks using any of the cards printed since the game's inception (though different official tournament formats only permit the use of certain cards, banning or restricting the use of some), so the possibilities for deck building are broad indeed. Generally a player wins the game by defeating all opponents. Players are usually defeated when their life total, which begins at 20 points, is reduced to zero. Damage or loss of life can be caused in numerous ways, usually through various sorcerous effects or by suffering attack from a summoned creature controlled by an opponent. Other spells alter conditions of the battlefield, creating strategic advantages and disadvantages. A significant portion of each player's deck must also be composed of cards representing land, from which the player draws magical energy in order to cast their spells. This energy, called "mana," can be produced in other ways, but generally comes from land cards. The game features five basic land types — mountain, plains, forest, swamp, and island — each of which produces a particular color of mana — red, white, green, black, and blue, respectively. A player may only play one land card per turn, and generally each land card can only produce one mana of the appropriate color each turn. The fundamental premise behind land cards is the bond established by the spellcaster (that is, the player) with physical locales they've visited, a bond which allows the spellcaster to call upon a naturalistic power inherent in every kind of terrain, a sort of hylozoistic life-force. The top line of the card notes the spell's name, and gives its mana cost, the amount and color of mana required to cast the spell. Here, the single fireball symbol indicates the cost of one red mana. Below, each card features original art commissioned for the game. While functionally irrelevant to gameplay, card art is nevertheless of major importance to many players and collectors. The next line under the art gives the card type on the left and the set symbol on the right. "Instant" is a kind of spell which can be cast at any time for a one-time effect. The set symbol indicates which set the card was printed in. Wizards of the Coast, publishers of the game, produce three or four new sets of cards each year, with each set containing between 150 to 250 cards. Some are reprints, while others are entirely new, but in any case set symbols determine the provenance of a particular copy of a card, which can be pertinent to its tournament legality. Below the type line we find the text box, which contains information about what the spell actually does. 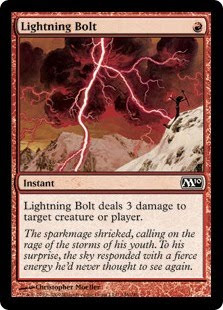 In this case, Lightning Bolt has a fairly straightforward effect: direct damage which can be used either to chip away an opponent's life total or to damage a summoned creature. Additionally, the text box may contain italic flavor text, which also has no significance to gameplay, but has been a popular source of amusement since the game's beginning. Flavor text sometimes contains fragmentary information about the game world, including quotations from in-game characters who may themselves exist as playable cards. This game world comprises a Multiverse of dimensions called planes, each a separate world more or less inaccessible to the others except by powerful spellcasters called planeswalkers who possess an innate ability to travel between planes. Each player of the game takes on the role of such a planeswalker, experiencing the various worlds explored in each new set of cards and collecting spells from these travels to add to their dueling repertoire. While the original set of cards sketched out Dominaria (sometimes "Dominia"), the central plane of the Multiverse, drawing on classical American and European fantasy tropes, subsequent sets of cards have drawn on other elements to create new planes with new flavor and new stories. Several comics and novels also continue to be published telling the stories of Magic in greater detail. The game as a ritual system, and the place of the player-as-planeswalker in that system. In the course of these discussions, I will assume at least moderate familiarity with the game on the part of my readers. As always, please ask any clarifying questions in the comments. Additionally, anyone wishing to learn more about the game can visit the Wizards of the Coast website here. The Wikipedia entry on Magic also contains more in-depth information. I look backward to it.